The TC-400G/L is a significant upgrade from the entry-level AC-powered preamps you'll find sold all over the internet, because its external power supply provides excellent isolation against hum and noise. Additional features include a ground wire terminal, gold-plated RCA connectors for input and output, and a LED power indicator. 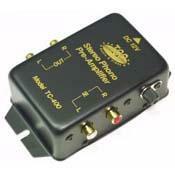 This is an excellent choice for use with component stereos, home theatre systems and better-quality PC sound cards.